Team :- Mike Harris (Capt), Paddy Maher, Roger Girling, Geoff Lucas, Chris Parker, John Stone, Vince Smith, Tony Taig, Nigel Spencer-Nott, Martin Hall, David Wilkinson, Brian Hopkins. Saturday only:- Alan Wade. Sunday only:- Mike Patton, George Hazell, Gilbert Grace. Despite dire weather warnings the first game on Saturday started dry but D team took advantage of the conditions to score two goals while we were still trying to remember what to do. The rain then set in and continued for the whole of the second game. Despite this difficulty, after conceding a first half goal we managed to hit form in the second half when Tony Taig terrorised the B defence, taking full advantage of good team passing to score an excellent hat-trick. A very good result which put the team in the right mood for the evening celebrations and further success was achieved by all arriving at the correct hotel. Sunday gave us much better weather. An honourable 1-1 draw was played out against A Team. We initially did our best to ensure favourable press coverage in the future by allowing Pat Rowley to score from point-blank range in the first half. After several penalty corners we found the right combination with George Hazell striking the equaliser from Nigel Spencer-Nott`s pass. A further draw was achieved in the final game, the equaliser scored by Brian Hopkins, rounding off a fine passing movement and confirming our standing as best second-half team. Attached is the Sunday Team happy photo, taken by Vince Smith`s selfie stick. How does he manage to hold it still after 100 minutes of energetic hockey? 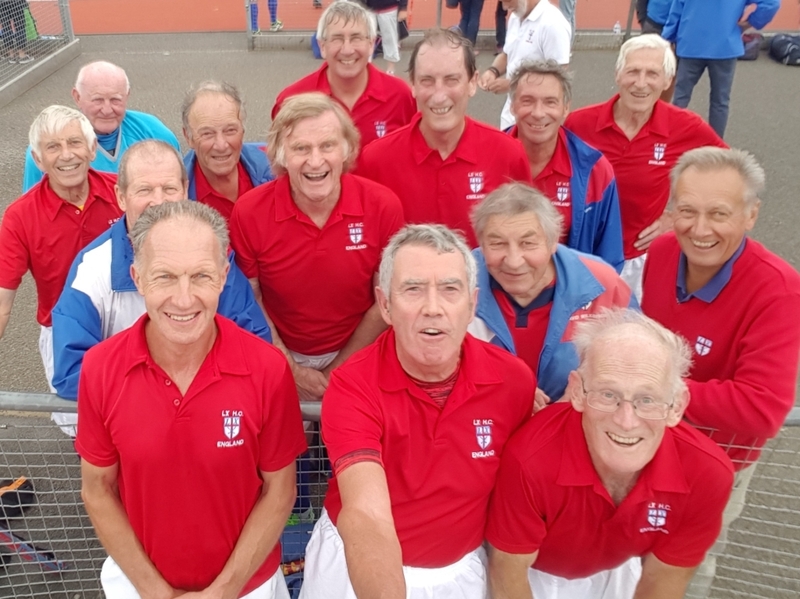 Finally our thanks to Club Captain Richard Slator for organising the hockey with four well-balanced teams, to the umpires Jean Roberts, Ben Rea, David Ewing and Trevor Denison, and to Geoff Lucas for the whole weekend. Match Report by Collective Memory (with thanks to Brian Hopkins, Tony Taig and George Hazell).